CCS America is dedicated to providing its customers with the highest quality LED lighting for image processing applications. Their innovative designs will give you images of superior quality and maximum contrast. CCS America offers high quality products and advanced lighting technologies, and is continually developing new lighting systems that will meet a diverse range of needs. Used by thousands of customers worldwide, CCS Standard Products are available in more than 300 standard and 5000 custom designs. CCS has been providing the most reliable, compact LED illuminators in the market since 1992. High-density ring light units are ideal for applications where irradiance must be focused at the center of the workpiece. With their low angle ring light units the edges of the workpiece and any engraving or damage on the surfaces can be detected clearly through low-angle illumination. Bar light units feature high-density LEDs mounted on a flat circuit board. They can be used for a wide range of applications because the illumination angle can be freely set. Backlights are designed to illuminate workpieces from the back. CCS AMERICA has introduced a new line of high output lights ideal for palletizing, web inspection, robot guidance, and packaging applications in the automotive and food and beverage industries. The robust aluminum design provides superior heat transfer for maximum LED performance. The HL Series is ideal for consumers who need high-intensity lighting in applications with long stand-off distances. 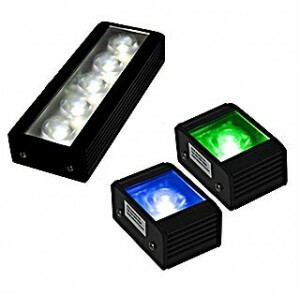 These high intensity lights are excellent for large area illumination and provide a long life – 50,000 hours typically. CCS America offers a quality line for general purpose machine vision applications. The QL series LED lights are designed for the budget-minded consumer. This complete line of lights utilizes 24-volt input. These high quality, cost effective lights provide simple connectivity with industry standard M12 connectors and provide high brightness and uniformity. R.R.Floody Company is a CCS America distributor in Northern Illinois, Iowa and Southern Wisconsin. We offer technical support to help our customers solve their applications.